As perhaps most of you have seen in our Weekly, we are reintroducing Adoration to our parish, beginning Tuesday, February 5. These “Holy Hours” will take place from 4 pm to 5 pm on Tuesdays and Thursdays, concluding with Benediction before the 5:15 pm daily Mass (the Sacrament of Confession will still be offered from 4:15 pm to 5 pm). 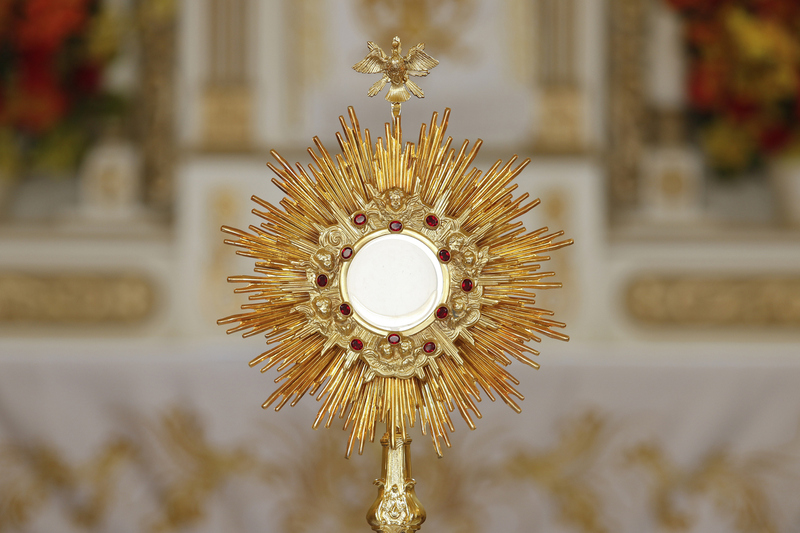 What we commonly call “Adoration” is actually properly termed “ Eucharistic Exposition,” which consists of exposing the Blessed Sacrament in a monstrance (from the Latin monstrare, which just means “to show”). At the beginning of the hour, then, a priest or deacon will expose our Eucharistic Lord in the monstrance, sing a hymn, and proclaim a reading from Scripture. The faithful are then invited to pray in silence in the presence of Jesus, which— admittedly—can be a little intimidating if you’ve never done it before. So what is “proper” in spending an hour with our Lord, exposed at the altar? Well, the short answer is: prayer! However that looks for you. Some might find it easy to recollect themselves, sitting quietly in the Lord’s presence. Meditation, most simply put, is just being with the Lord, relating your joys and your sorrows to Him, delighting in Him even as He delights in you. Many find it helpful to bring a list of people or things they have promised to pray for. If you’re an extrovert and external processor like me, you might find it helpful to write your prayers in the form of a journal (for me, at least, this practice usually keeps my mind from wandering to my to-do list or the otherwise trivial things that pop into my mind and helps me focus on praying at length on one particular person, situation, passage of Scripture, or grace). Bringing a Bible and practicing the age-old art of lectio divina (“Ok Google: what is lectio divina?”) can be another way of getting in touch with God through His revealed Word. •Spiritual reading is also a great way to spend a part of your holy hour, engaged in the lives of the saints or reading a classic on prayer or the spiritual life. Honestly, how you spend your time in Adoration is secondary. What is primary is that you spend time with our Lord, who desires us no matter how distracted we come and pursues us now matter how far we stray. When I was in college (before I entered seminary), a priest once told me: if you want to be holy, spend an hour in Adoration every day and come to daily Mass; it will change your life. I can honestly say that the effects weren’t immediate or even perceptible. But the Lord did change my life. He has a way of doing that, if we let Him. 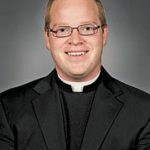 Father Michael Friedel is a Parochial Vicar at the Cathedral.